The Road to FolkFest Concert Series is proud to present The Small Glories (October 6), Union Duke (November 24), The Slocan Ramblers (February 8) and Dave Gunning (March 29) for their 2018/2019 season. 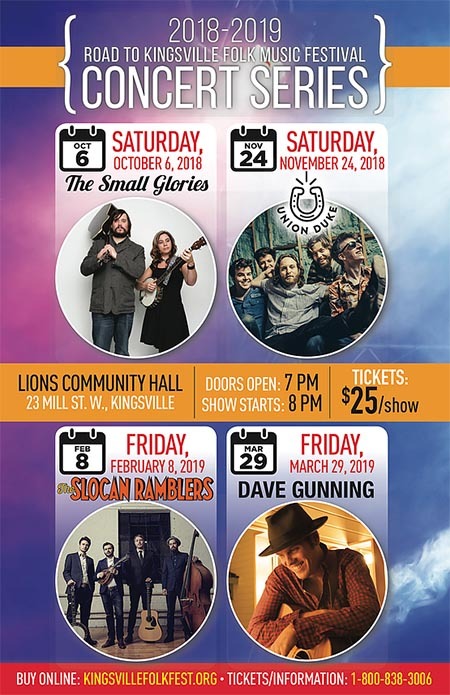 The Road to Folkfest Concerts present multiple award-winning recording artist and internationally acclaimed songwriter, Dave Gunning at the Kingsville Lions Community Hall on Friday, March 29, 2019. 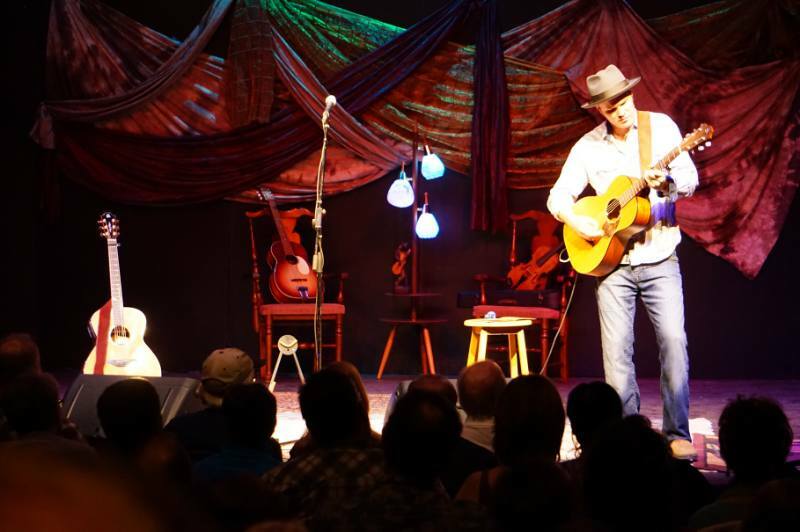 Dave Gunning is a charismatic performer and world class songwriter. Dave has the magnetic gift of captivating audiences by painting pictures through his heartfelt stories and compelling songwriting, humorous lyrics and stunning musical arrangements. Blending sensitive folk and innovative arrangements to his original songs, Gunning is rapidly building a solid fan base across Canada and abroad. Dave Gunning is a Festival favorite having played our festival and our concert series in the past and has a new album coming out this march titled Up Against the Sky. Be sure to not miss out on this show, tickets will sell out! Seating is limited, the popular series is often sold out and tickets must be purchased in advance. Tickets are $25 per person, and available by calling 1-800-838-3006 or online at Brown Paper Tickets. 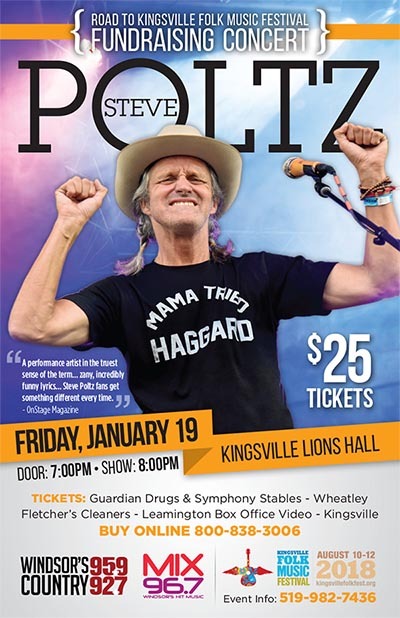 Road to FolkFest Concerts presented Canadian singer-songwriter Steve Poltz at the Kingsville Lions Hall on Friday, January 19, 2018. Steve Poltz is a Canadian singer-songwriter and guitarist. He is a founding member of the indie-rock band The Rugburns and is best known for his collaborations with singer Jewel, especially the 1996 single, “You Were Meant for Me” which reached number 2 in the US. As a solo artist, he often performs acoustic-only “good old-fashioned sing-along” shows. His songs have been noted for their simple melodies and satirical lyrics. Poltz was born in Halifax, Nova Scotia, Canada and later immigrated with his family to Pasadena, California, then to Palm Springs, California. He attended the University of San Diego, where he received a degree in political science, he met guitarist Robert Driscoll and The Rugburns were formed. Poltz and his bandmates developed a local and national cult following by playing coffeehouses and bars. While performing dates at the Innerchange Coffeehouse in San Diego, he formed a relationship with Jewel, frequently opening for her on tours, co-writing songs, and appearing in her music video for “You Were Meant For Me.” The song won her 2nd place on the U.S. Billboard Hot 100 song charts, charting in four other categories in the USA, and several European countries. In 1998, Poltz released his first solo album, One Left Shoe, for Mercury Records. A disagreement in the artistic direction of his material led to him leaving the label and forming his own company, 98 Pounder Records. Five years later, he recorded Chinese Vacation, an album heavily influenced by the events of September 11 and the murder of one of his closest friends. During a radio interview and performance on the Dave, Shelly, and Chainsaw radio program, he performed a “male” version of “You Were Meant For Me”. 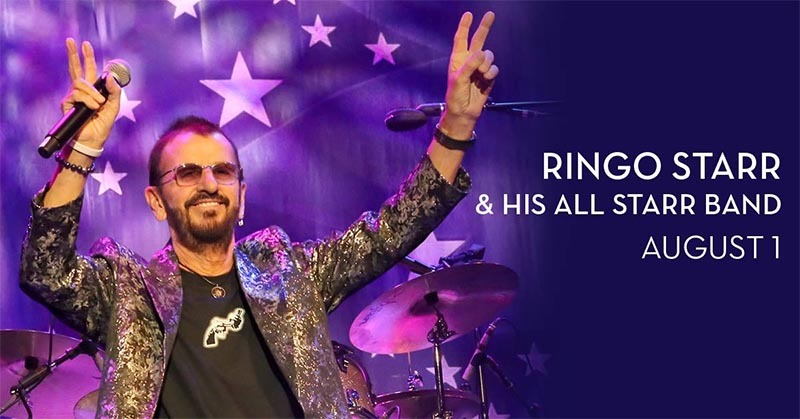 During the bridge, he went on a 5-minute rant on David Cassidy and assorted stories in Las Vegas, including one that led to the album name “One Left Shoe”. Poltz also performed the song on the Bob and Tom Show and included the Cassidy story during the bridge. In 2000, Poltz was awarded the title of “San Diego’s Most Influential Artist of the Decade” at the 2000 San Diego Music Awards. 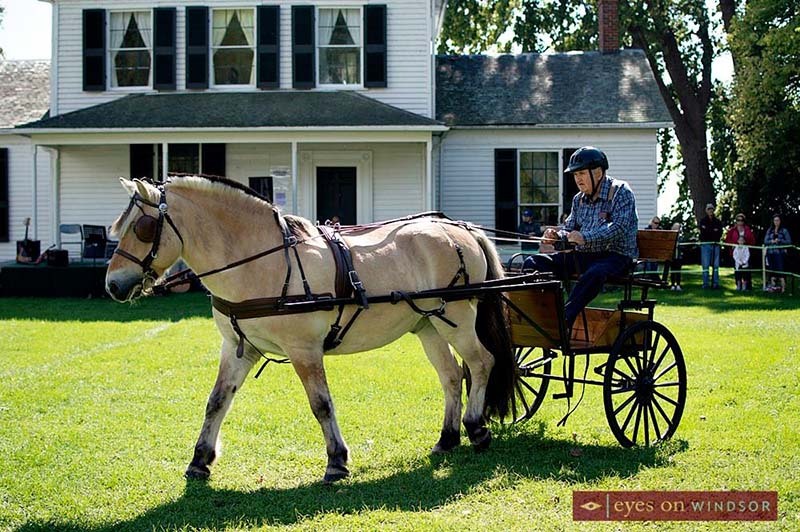 In 2012, Poltz guest-starred in the web series Up the Creek as a Canadian country singer named Peeve Stoltz. He improvised the songs in the episode during filming. Poltz has collaborated as a songwriter with A. J. Croce on Croce’s 2004 album Adrian James Croce. Poltz is known to name his various guitars. They include Smokey Joe, which he saved from being destroyed, Clackety-Clack, Flowerpot, and Trailer-Trash. 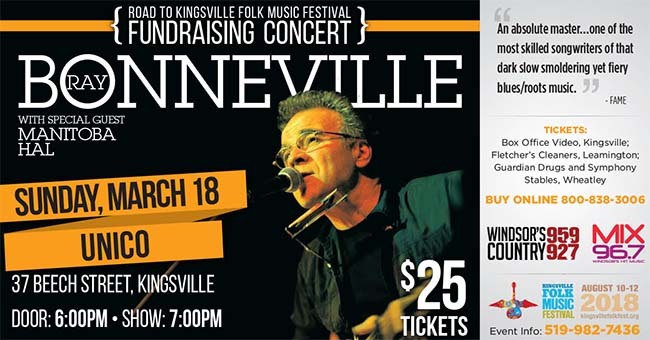 Road to FolkFest Concerts presented blues-influenced, New Orleans-inspired “song and groove man” Ray Bonneville with special guest, ukulele master Manitoba Hal at the Unico Hall in Kingsville on Sunday, March 18, 2018. Ray Bonneville is a poet of the demimonde who didn’t write his first song until his early 40s, some 20 years after he started performing. But with a style that sometimes draws comparisons to JJ Cale and Daniel Lanois, this Juno Award winner has found his rightful calling. Born in Quebec, his family moved to Boston when he was 12. He served a year in Vietnam as a Marine, struggled and overcame drug addiction, earned a pilot’s license in Colorado, then moved to Alaska, then Seattle, and Paris and New Orleans. But it took a close call while piloting a seaplane across the Canadian wilderness to make him decide it was time to get busy writing songs – gritty narratives inspired by a lifetime of hard-won knowledge set against his gritty, soulful guitar and harmonica playing. Also performing is master of the ukulele Manitoba Hal. For over 15 years, Canadian blues artist Manitoba Hal has been forging a career as one of the country’s most preeminent roots and blues multi-instrumentalists. With 14 recordings under his own name and appearances on countless others, guitarist, ukulele master and singer-songwriter Manitoba Hal is a musical renaissance man. 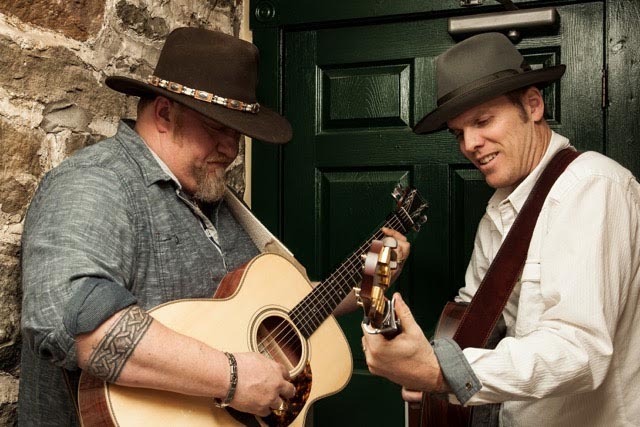 Road to FolkFest Concerts presented two of Canada’s greatest roots singer-songwriters, Dave Gunning and J.P. Cormier, live in concert at the Jack Miner Migratory Bird Sanctuary Stadium on Friday, April 13, 2018. The pair thrilled the crowd when they performed together at last year’s Kingsville Folk Music Festival. Gunning and Cormier have finally done what everybody’s wanted — heck, what they’ve wanted — for years. Dave Gunning and J.P. Cormier are releasing their first album together, called Two. Great friends, frequent collaborators, co-writers and touring partners, the pair has been talking about this album since pretty much the day they met. Now their new album is here, and it’s everything fans hoped and dreamed it would be. While these award winning East Coast performers toured to celebrate their new album they performed locally at the Jack Miner Bird Sanctuary as part of the Road To FolkFest Concert Series. For those who dont know of Madison Violet, it all began in 1999. Brenley and Lisa met over weak coffee and broccoli omelettes, in a restaurant called The Green Room, in Toronto. It was a chance meeting, 1900 kms away from the small town where both Lisa and Brenleys fathers were born. That was nearly 17 years ago, and the pair have been writing and creating beautiful music together ever since. When you hear them, the first thing youll notice is that their voices blend together, symbiotically, like family: Born to sing the same songs. And over the past decade and a half, the pair have taken to genre-bending, moving effortlessly from folk to pop to electronic to Americana. In a word, they are musical chameleons. Madison Violets first 2 studio albums, Worry the Jury and Caravan, were recorded with notable producer John Reynolds (Sinead O’Connor, U2, Damien Dempsey) and were critically acclaimed, garnering the pair several ECMA and CFMA nominations. Their 3rd and 4th releases, No Fool for Trying and The Good In Goodbye are homegrown collections, recorded in Ontario with producer Les Cooper at the helm. Their 5th studio release, was recorded in Toronto by acclaimed producer, Tino Zolfo (Carly Rae Jepson, Soul Decision, Hawksley Workman), and solidified the duo as musically versatile powerhouse songwriters. This Christmas, Madison Violet released their first holiday album, ‘Sleigh Bells In The Snow’ to rave reviews. It is an eclectic mix of Christmas songs, old and new, which also featured their good friend, Ron Sexsmith, on ‘Frosty The Snowman’. And finally, their newest collection of songs ‘The Knight Sessions’ is a mix of stripped back, acoustic takes on some of their more upbeat musings as well as a new batch of poetic and heartfelt tunes. Over the years, Madison Violet have acquired quite a few accolades, including a Juno nomination, a Canadian Folk Music Award for Best Vocal Group Album of the Year and a Critics Choice award from Country Music Peoples Magazine. Their songs have been featured in the notorious music magazine MOJOs Top 10 Playlist, and received a mass of acclaim from outlets such as the BBC, the CBC, Maverick Magazine and NPR, and have earned the duo the Grand Prize in the 2010 Maxell John Lennon Song Writing Contest (which was voted on by a panel of distinguished artists including Elton John, Tim McGraw, Black Eyed Peas, Fergie, John Legend, Enrique Iglesias and Mary J. Blige). Madison Violet were on Germanys WDR’s list of Best Bands of All Time as well as having song placements on various television shows. Their recent single These Ships was released on one of the largest dance labels in the U.S., Ultra Records, and has garnered over 1,000,000 plays on Spotify already. Brenley and Lisa are singer-songwriters. Multi-instrumentalists. Harmonizers. Dog lovers. Nature walkers. Painters. Tennis fanatics. Amateur chefs. They have been described as pop, roots, indie, dance and Americana, but this quote sums them up best, “Madison Violet has suddenly appeared like a ray of sunshine on a rainy day,” says No Depression. The Small Glories, a musical union, weaving and tangling traditional folk, modern folk, and roots music, performed at the Kingsville Lions Community Hall on Saturday, October 6, 2018. Straight out of the gate, veteran singer/songwriters Cara Luft & JD Edwards built a buzz around their tight harmonies, authenticity, visceral live performances and equally well-matched guitar prowess that doesn’t come around often. Luft packs a mean banjo as well. The Road to Folkfest Concerts presented Union Duke, the incredible high energy modern folk quintet, at the Kingsville Lions Community Hall on Saturday, November 24, 2018. Sweat flies and floorboards tremble – Union Duke is a Toronto folk quintet with an explosive live show. Bridging soulful indie rock with bluegrass and country, the group belts out soaring harmonies with three, four and even five voices. Their songs are irresistible. These five guys have been making a commotion in one way or another since they were kids, and years of making music together have brought them to this: a heartbreak of twang and a bootshake of rock and roll. Union Duke is two fifths city, two fifths country, and one fifth whiskey. They travel coast to coast playing to fans young and old. They’ve played sold out shows where crowds know all the words. They’ve performed at countless festivals including TURF, Mariposa, and Summerfolk, topping the list of must-see acts. 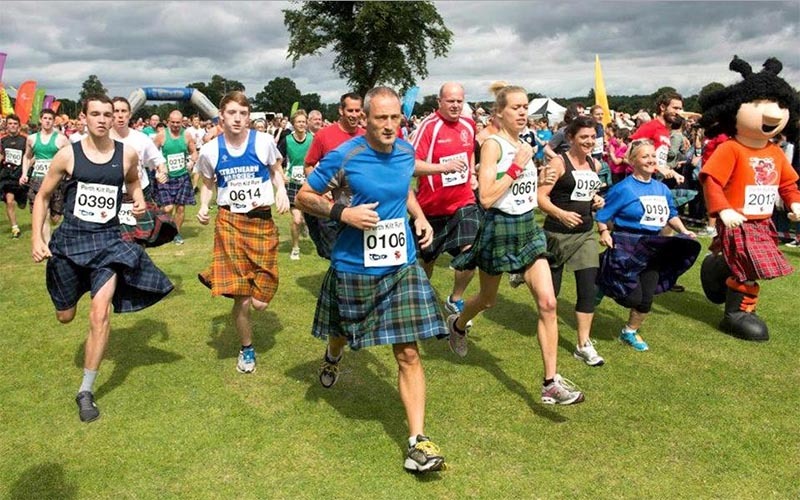 Their enthusiasm is infectious, and they leave every audience smiling. The Road to Folkfest Concerts presented Slocan Ramblers, known for high energy performances, at the Kingsville Lions Community Hall on Friday, February 8, 2019. The Slocan Ramblers promotional photo. 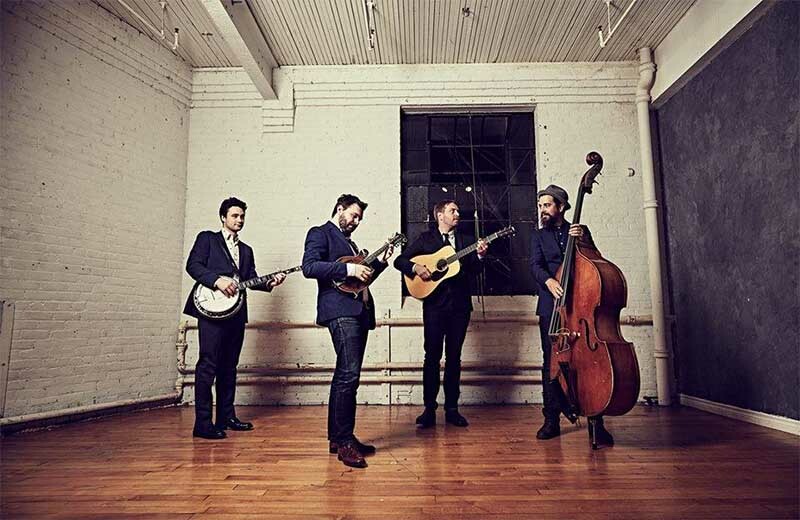 The Slocan Ramblers are rooted in tradition, fearlessly creative, and posses a bold, dynamic sound. With a reputation for energetic live shows, impeccable musicianship, and an uncanny ability to convert anyone within earshot into a lifelong fan, The Slocans have been winning over audiences including last summer’s Kingsville Folk Music Festival as well as Merlefest and Rocky Grass . They are a unique blend of bluegrass, old-time and folk with deep song-writing, lightning fast instrumentals and sawdust-thick vocals. The Road to FolkFest Concerts present some of the best Canadian and International talent: Festival favourites and high-profile touring acts. Road To FolkFest Concerts are a fundraising project for the Sun Parlour Folk Music Society (Kingsville Folk Music Festival). This project has been made possible in part by the Government of Canada. The Sun Parlour Folk Music Society exists to provide diverse high quality folk music through concerts and the annual Kingsville Folk Music Festival and allocates funds to the MAY FUNd (Music and Arts for Youth) which provides financial assistance to disadvantaged area youth to access the arts through workshops, lessons, mentoring sessions and an annual scholarship. This year the 6th Annual Kingsville Folk Music Festival will take place on August 9-11, 2019.